Hello! I hope this finds you all well. Today’s book is one of my favourite children’s books, Harry and the Wrinklies. I can’t remember how I ended up with such a copy but I loved it and watched the tv series when it aired on CITV. We meet Harry at the funeral of his wealthy parents and he is being shipped off to live with his ancient Aunties in the middle of no where. As soon as he sees them on the platform he feels so disappointed in how his life is turning out to be. He loved his parents and his life. However, on the drive to his new home, Auntie Florrie shows off her car’s ability and this old rusted car turns into a purring race car. This is just beginning of the strange happenings that occur around his Aunts. Upon arriving at Lagg Hall, Harry meets the rest of the inhabitants and his Aunt’s friends: Mrs. Good, the housekeeper; Nutty Slack, Gardner and Handyman; Dot, Fingers, Huggy, Angel, Max and Tangle – Harry’s new dog. In the first few days, he has more fun with these pensioners than he has ever had in his life and he realises that perceptions can be deceiving. With the stories of a haunted woods, the arrival of his evil ex-nanny and the burning question of what are the OAP’s up to late at night, Harry has plenty to keep him (and us) occupied at Lagg Hall. I’ve already stated that this was my favourite book and it is easy to see why. As a child, this book holds all the mystery and danger needed as well as good guys and bad guys. Everything is seemingly black-and-white but with grey areas only noticeable as you get older. The idea of grandparent like figures being as fun and as adventurous as Harry’s new family is, is one that many children’s authors have grasped and run with i.e. David Walliams’ Gangsta Granny. Temperley creates an idyllic world, not dissimilar to Enid Blyton’s world. Harry lives in a massive old mansion, with a tower bedroom, woods, lake, folly and animals. The ideal place to grow up. The amount of danger present does suggest more of an older child reader, with bodily harm coming to Harry often. Yet the good guys win and the bad guys pay, as how it should be. All in all, a great book. One that I still read now and remember my love of it as a child. My verdict 9/10. 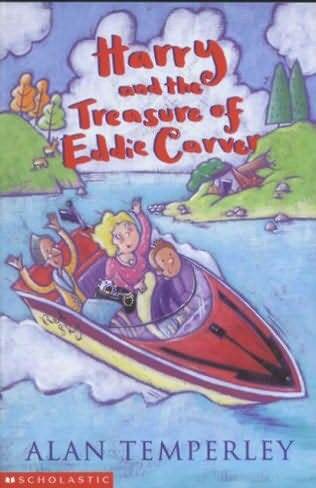 The follow up isn’t as good but if you loved this one then get the sequel; Harry and the Treasure of Eddie Carver. Book Ends · From crime fiction to teen fiction and everything in between!